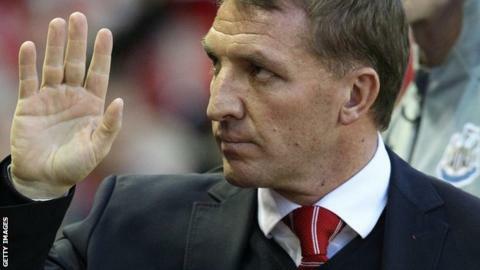 Liverpool boss Brendan Rodgers believes Manchester City's Premier League struggles have "opened the door" to the Reds' hopes of Champions League qualification. Monday's 2-0 home win over Newcastle moved Rodgers's men four points off the top four with six games to go. "We feel we have every chance," he said. "Of course, we're looking for other teams to slip up. "I am sure there will be plenty of twists and turns to come." He added: "We're going to fight until the very end. As we saw last year there can be a lot of changes." Goals in each half from Raheem Sterling and Joe Allen at Anfield ensured Liverpool took full advantage of City's derby defeat at Manchester United the previous day. The 4-2 loss was a fourth successive away league defeat for Manuel Pellegrini's side and leaves them in danger of not qualifying for the Champions League for the first time since 2011. Liverpool, who play Aston Villa in an FA Cup semi-final at Wembley on Sunday, arrived at Anfield in desperate need of a win after two successive league defeats. But they are 20 goals behind the Premier League champions in terms of goal difference - effectively giving City another point on them. Liverpool moved a point ahead of Southampton into fifth, which is a Europa League qualifying position; with Tottenham a further two points back. "Tonight was very important," Rodgers added. "We knew we had to win. If we keep winning our games we'll see what will happen. "We've got important players coming back now. Manchester City have maybe opened up the door a wee bit." Should Man City keep Pellegrini? Read more on Manuel Pellegrini: Should Manchester City keep manager?